I am in the process of preparing a presentation on Stack Overflow for the Sandia .NET User Group. 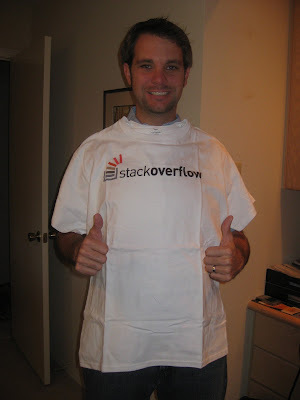 In simple terms Stack Overflow is a programming question and answer site that's free. If you have not heard of it you are either not a programmer or have not been standing near me when I am singing the site's praises. 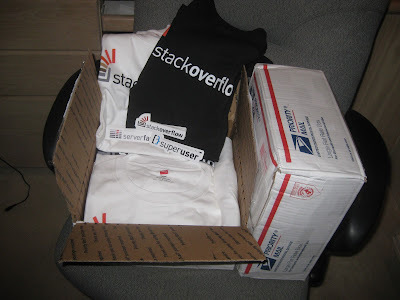 I will link to the presentation when I have it prepared, but for now I wanted to thank Jeff Atwood and Emily Yacus at Stack Overflow for being so cool as to provide me with t-shirts and stickers to handout after my presentation. © 2010. Steele Bit. Powered by Blogger. Theme design by WPShoppe and Converted by Ritesh Sanap.